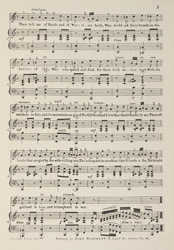 The process used to print this sheet music cover illustration is known as lithography. It is based on the principle that grease repels water whilst limestone will absorb both grease and water. A design is drawn with wax on a plate which is then washed with water. It is then inked and only the design will retain the ink. Lithography was introduced to Britain in 1800 and by 1840 chromolithography, printing in colour, was widespread.